Welcome to Mongolia. Meet your guide at the airport/train station. Transfer to Hotel. Rest. In the afternoon, lunch at a cafe. Visit to National History Museum of Mongolia to get historical knowledge of the country and Sukhbaatar Square for city orientation. In the evening we’ll have exciting performance in Tumen Ekh Chuulga to see traditional folklore such as dance, song, Buddhist ritual mask dance. Dinner at a restaurant. Overnight in ***hotel. After breakfast drive to Terelj National Park from Ulaanbaatar. On the way you will be introduced with the small town people’s living standard, herder families, pasturing livestock, Monk cave and Turtle rock. Arrive in the Princess tourist camp. Introduce with camp and its surrounding environment. 13.00 Lunch in the Ger restaurant. Relax in national Ger in the beautiful Khan Khentii Mountain. Free time. Sauna and shower time. Evening programs of interest and bonfire. 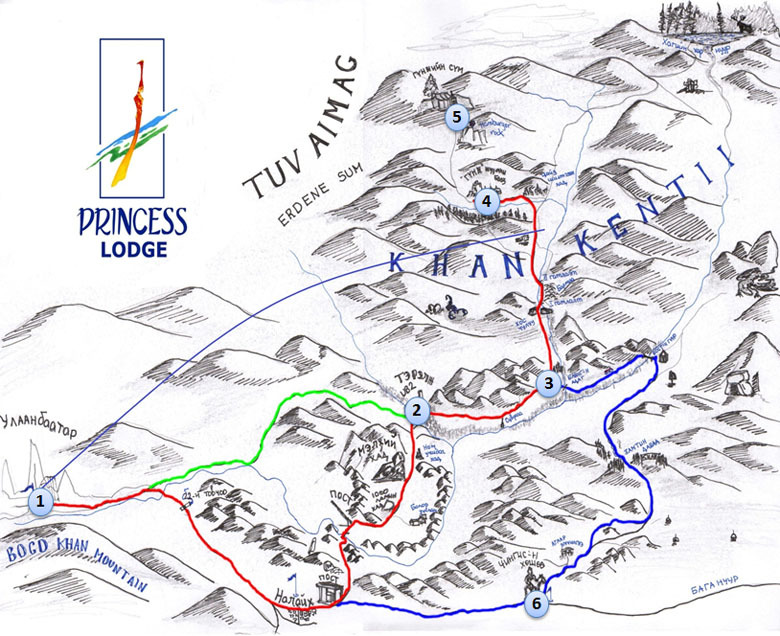 You will spend 2 nights in princess ger camp in the mountains. Dinner and overnight in the camp. Breakfast. Preparations for the journey. Starting journey. Ride an Ox-cart like a nomadic Mongol to Princess Temple. We ride and walk 8kms through spectacular valleys and across small rivers surrounded by highly-“eroded rock formations of the Khan Khentii Mountains. Cafe breaks on picnic at a site chosen for its spectacular setting. Visit the ruins of Princess Temple, was built in 1740. Return to the camp. Overnight in the camp. After breakfast drive to Chinggis Khaan Statue Complex. Visit Chinggis Khaan Statue Complex. Drive to Ulaanbaatar. On the way dinner in Mongolia hotel. Overnight in ***hotel. Tour ends: After breakfast at the hotel you will be taken to the train for departure. 2 Overnights at a ger camp.